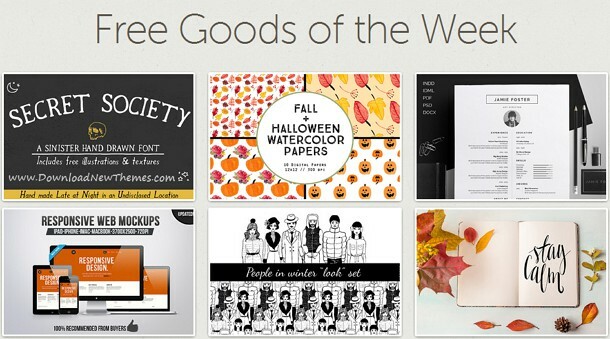 They have released Free Goods of the Week on 12th October 2015. They’re available until midnight of 18th October 2015. Grab this weeks freebies from across Creative Market. Secret Society is a hand-drawn font inspired by shady dealings, nefarious henchmen and ghost stories. Secret Society will look just as good on your awesome design as it will on your (patent medicine label, tattoo, death threat, ransom note, wanted sign, tombstone, blood pact, etc.). But this is so much more than just a font. This weeks free font on creative market. This listing is for 10 JPEG digital patterned papers. 8 are seamless, 2 are not seamless. Each file is 12x12" and 300dpi. This weeks free Halloween watercolor on creative market. 'Jamie', a beautiful vertical design with a small photo. Including a single page resume/cv and cover letter. International A4 & US Letter sizes included Includes 90 Social Icons for use within your layout. This weeks free Resume Template on Creative market. This pack allows you to display you designs with 12 different Design Layout.This pack ideal for responsive web design showcase, Apps Design etc. Pack Contains iMac, iPhone, iPad, Macbook. This weeks free design mockup on creative market. People in winter "look" set. Set of 1 seamless pattern, 3 separate girls and 3 men. EPS 8, high-res JPEG and isolated PNG included. This weeks free graphics illustration on Creative market. Hey guys, if you are looking for something trendy, cute yet classic to display your beautiful artworks then this is a right place for you. Make your products look more professional with this styled mock up photo! Present wedding invitation, calligraphy, doodles and other images of your choice on your blog, social media websites, etsy shop and other market places. This weeks free autumn mockup on Creative market. Item Reviewed: Download 6 Amazing Free Goods of the Week 12 to 18 Oct 9 out of 10 based on 10 ratings. 9 user reviews.